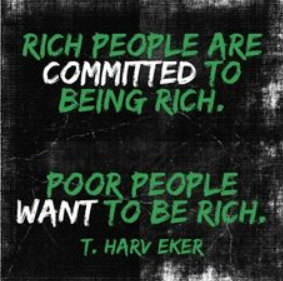 I made it a practice to listening to Secrets of The Millionaire Mind by T Harv Eker at least once a month since I purchased it two years ago. If you never read or listened to it, do yourself a favor and pick it up. The first thing and toughest thing to do is to disassociate yourself from the negative learned behaviors built up since childhood. You know all the sayings we heard from our parents and other relatives and even friends…. Money doesn’t grow on trees..
What do you think I’m made out of money.. Believe me I had many negative feelings toward money and wealth in general and it goes back to listening to my parents yelling and screaming about never having enough. I am so grateful shortly out of high school I had a very wealthy person who helped position me for success. From him I learned rich people are really not greedy and he was also very nice to me and all people he comes in contact with. What I didn’t know back then is that we all have a subconscious money blue print and we will always prove it to be true unless we continue to work on our mental blocks toward wealth and money. We create our own reality based on our files kept in our subconscious mind and those files are collections of everything learned whether negative or positive and that is the only data we have to make decisions. So it definitely explains what risks we are willing to take and also our spending habits if we happen to come in to more money for some reason. We can create a new money blue print, it will take work but it is worth it right? Do you want to live week to week forever or know that your money is working for you while you enjoy time with your family and friends? In the book Secrets of The Millionaire Mind you will be given a set of declarations to help you in the process of increasing your money blue print. I know to some people this may seem weird but would you rather be normal and poor or weird and rich?